The WPAdverts 1.2.2 was just released and you should see an update notification in wp-admin panel within 24 hours max. Aside from the changes under the hood we did (will be described below) we made one change visible to anyone. Since version 1.2.2 you can now display Ad images in the Recent Ads Widget. This option is disabled by default (so if you are using this widget your layout will not change). The Brazilian translation got a huge update. in wp-admin / Plugins panel, the padlock icon next to “License” text was showing too big. we now have a forked version of the SwipeBox script, the old one was not working properly with jQuery 2.0 and newer. The result was that when the user clicks on an image in the gallery, then the gallery just shows a black screen. in some cases, the Gallery on Advert details pages was not loading the images (making the Advert look like it has no images at all). In the Forms API we registered an adverts_field_password. It is not being used right now, but it will be in the Authors plugin we are planning to release this month. The plugin will allow creating user profiles where visitors will be able to see information about the Author and all of his active listings in one place. More information about the Authors extension will be available soon on the blog. If you would like to stay up to date subscribe to this blog. 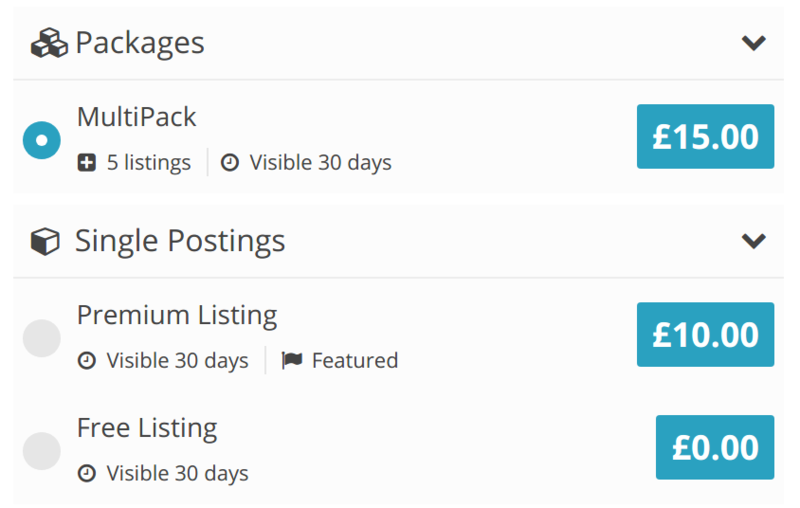 In the meantime, we are also working on the update for our WooCommerce Classifieds extension. Like with the Authors plugin more information about it will be available soon on the blog. Right now i can only tell that it will allow recovering abandoned payments and users will be able to purchase posting packages. Purchasing packages from the [adverts_add] form. p.s. : hope you will add something like the “Private Messages”-plugin, so user can send messages instead of using a form. The other add-on I would really appreciate is the option to bid on a listing. Nevertheless, keep up the great work! Thanks! We were working on a plugin similar to private messaging, but due to some problems with the plugin performance we had to abandon, but i hope we will start over one day.